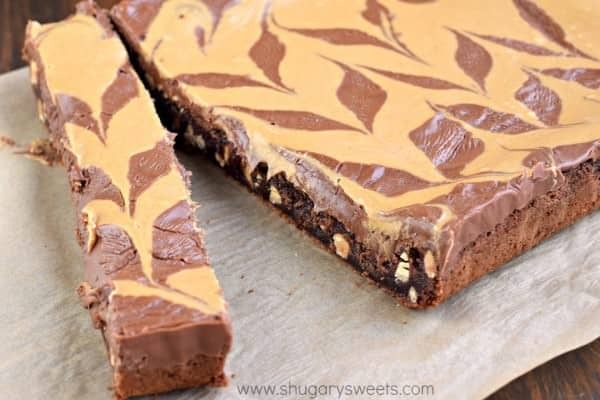 Peanut Butter Brownies: fudgy, homemade brownies with a thick chocolate frosting and swirls of creamy peanut butter! 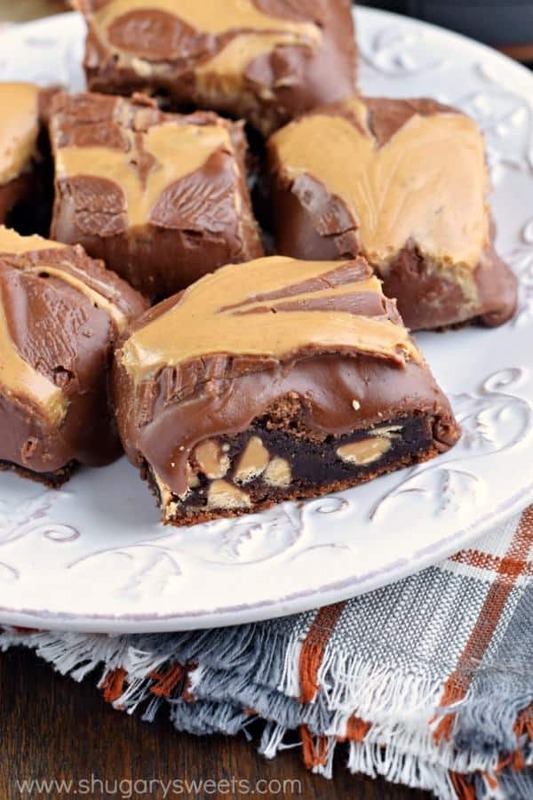 If you love chocolate peanut butter treats, you’re going to LOVE these! I’m not a huge fan of peanut butter and chocolate. I mean sure, I love to take a whole Hershey bar and dunk it into a big jar of peanut butter. And yes, I love Reese’s peanut butter cups. But does that make me a huge fan? Fine. I am fan. And today’s Peanut Butter Brownies are for fans only. Like, seriously, you have to LOVE chocolate and peanut butter. The brownies start with the most fudgy, decadent base, and I added a bag of peanut butter chips to it. Then I topped these brownies with a THICK layer of rich chocolate frosting. Finally, I melted a cup of peanut butter and swirled that into the frosting. Can I get an “amen”? 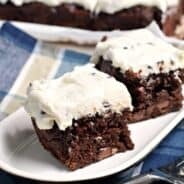 The frosting on these brownies is soft and creamy. You’ll see that after cutting it sort of seeps down over the sides. You may need a napkin. A handy wipe. A washcloth. Seriously, these are amazing. I heated up some creamy peanut butter in the microwave for about 30 seconds and then drizzled it on top of the soft chocolate frosting and swirled it in. The only downside to this recipe is you need to refrigerate these brownie to allow everything to “set” properly. I know. You want to just dive in. I mean. You can. It will taste amazing. But you may need a spoon to scoop it warm out of the pan. And if you DO go that route, you might as well top it with some ice cream. Just a suggestion. Once these have been chilled (about 2 hours), feel free to slice and enjoy (unless of course you’ve already dug into them warm, haha). I store them in the refrigerator in an airtight container, to keep the frosting firm. 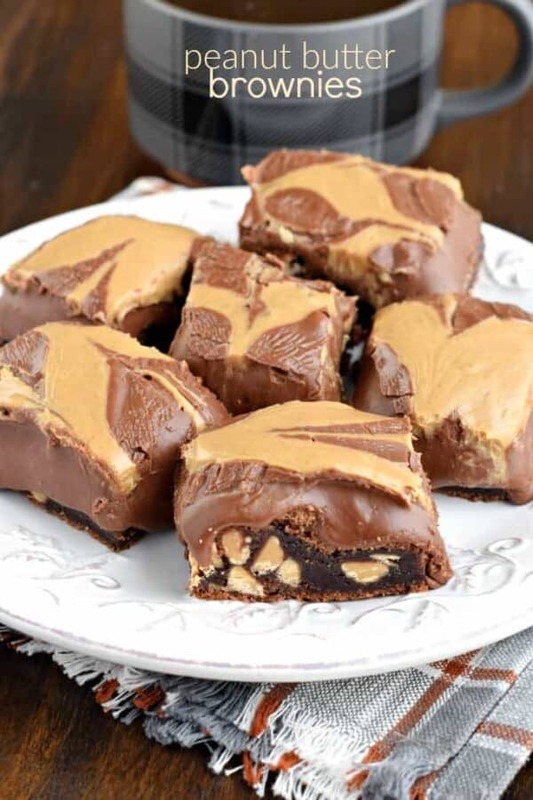 Peanut Butter Brownies: fudgy, homemade brownies with a thick chocolate frosting and swirls of creamy peanut butter! 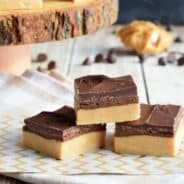 If you love chocolate peanut butter treats, you're going to LOVE these! Preheat oven to 400°F. Line a 13x9-inch baking dish with parchment paper. Set aside. For the brownies, in a small saucepan over medium high heat, combine butter, cocoa powder, and oil. Bring to a boil while stirring constantly. Remove from heat. In a large mixing bowl, combine sugar, eggs, milk and vanilla. Slowly stir in butter mixture. Add in flour, baking soda and salt. Stir just until combined. Fold in peanut butter chips. Pour into prepared baking dish and bake for 20 minutes. Remove from oven and place on wire rack. Meanwhile, prepare frosting. In a small saucepan, combine butter, milk, and cocoa powder. Whisk over medium high heat, until mixture begins to boil. Remove from heat. In a mixing bowl, combined powdered sugar with butter mixture. Beat until smooth (several minutes). Pour over warm brownies. In a small microwave dish, melt peanut butter for 30 seconds. Pour over chocolate frosting and using a knife, swirl it in. Refrigerate brownies for 2 hours (or overnight). Slice and enjoy. I store these in an airtight container in the refrigerator and serve chilled. YUM. 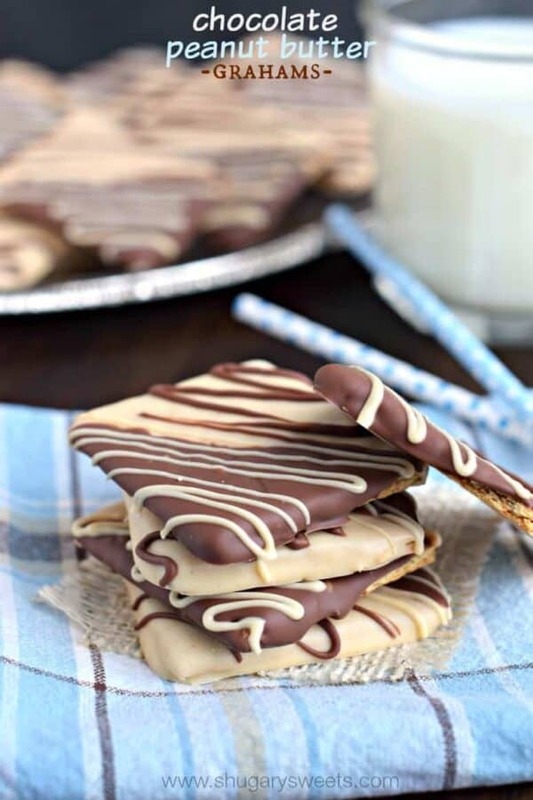 Chocolate Peanut Butter Grahams: an easy treat that tastes fantastic!! 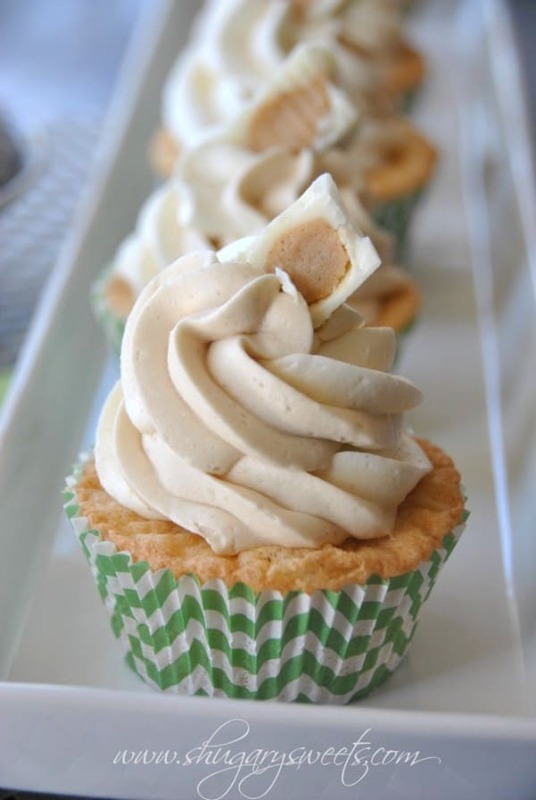 White Chocolate Peanut Butter Cupcakes: from scratch cupcakes with a peanut butter swirled frosting! 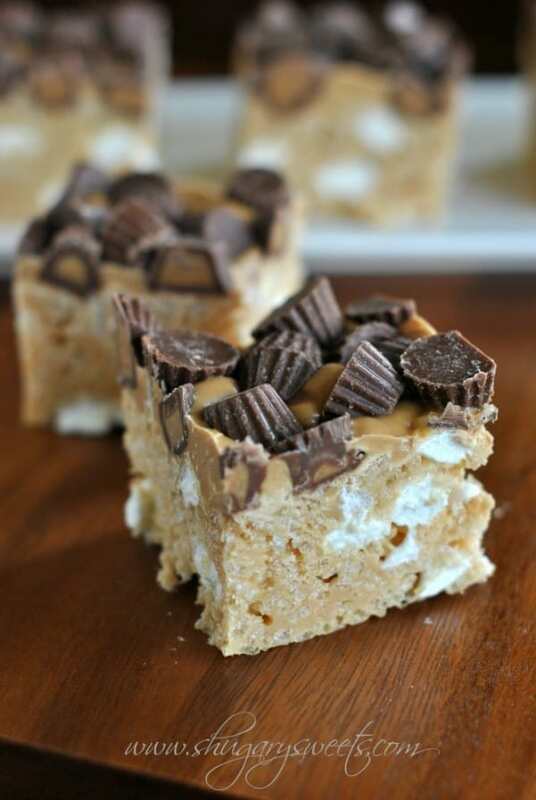 Fluffernutter Krispie Treats: chewy, delicious chocolate, peanut butter and marshmallow treats! These look incredible. Like, I’m planting my face in the frosting in my head right now. Such happiness! 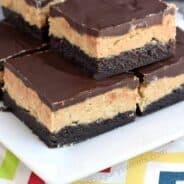 I could definitely eat peanut butter and chocolate just about every day, especially it were in the form of these brownies! These look SO good! I wish I could just dig into these for breakfast! I’m running a marathon on May 15th…These will be in my belly May 16th! These look absolutely unreal! The PB chips in that fudgy base and the peanut butter swirled into the frosting? You know what’s up 🙂 Pinning! OHMYLAWD these brownies look insanely rich and decadent!!! Is this just regular milk? I looked at the buttermilk brownie recipe and it looked like this one best I could remember what it said. With this recipe I did just use regular milk instead of the buttermilk. I liked the flavor better with the peanut butter! I saw your video on FB and just about died. NEED. Oh my word, these brownies are NEXT level Aimee! They look AMAZING! Pinned. Love the thick layer of frosting! Perfect rich and decadent! 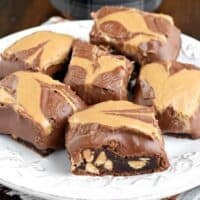 I totally agree – how can you not love peanut butter and chocolate? Can’t wait to try this, thanks for sharing! That frosting layer looks fantastic! I need to get a Hersey bar and dunk it in peanut butter :). That is a wonderful idea! The frosting on these looks SO GOOD! I can’t even handle how amazingly awesome these are!